Brand new SM7 wedge in a slate finish with a blue tint. Main differences? apart from the gorgeous new finish you get a upgraded Nippon N.S. Pro Modus3 125 shaft and BV Wings custom grip. The rich slate finish with a tint of blue provides a premium look, with the finish durability of a traditional chrome wedge. The stock build for these wedges includes a Nippon N.S. Pro Modus3 125 shaft and BV Wings custom grip. All SM7 loft, bounce, and grind options are available for custom order. Introducing Vokey Design SM7 wedges. Through improved progressive CG, optimised spin milled grooves, and the game's benchmark for Tour validated grinds, new SM7 wedges offer maximised spin, control, and consistency for more confidence on every shot. Put the highest level of wedge performance in your hands. Spin Milled Grooves optimise spin, control, and consistency for more confidence on all wedge shots. The centre of gravity (CG) can vary slightly between different lofted wedges, based on the bounce and sole grind of the wedge. 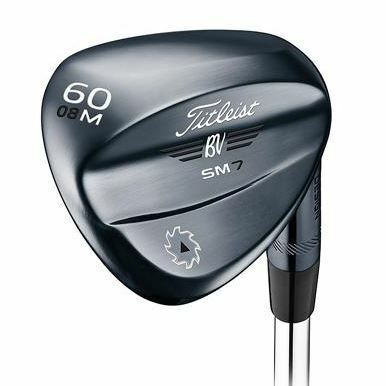 Vokey Design SM7 wedges feature a progressive centre of gravity, optimised for each loft, bounce and grind for improved distance control, tighter shot dispersion and exceptional feel throughout the wedge set.